Oblique aerial view centred on the electricity generating station and the military way, taken from the SW.
General oblique aerial view centred on the dam and the electricity generating station, taken from the SSW. Ben Cruachan. General oblique aerial view centred on the dam and the electricity generating station, taken from the SW.
Awe/Ben Cruachan scheme (1965). 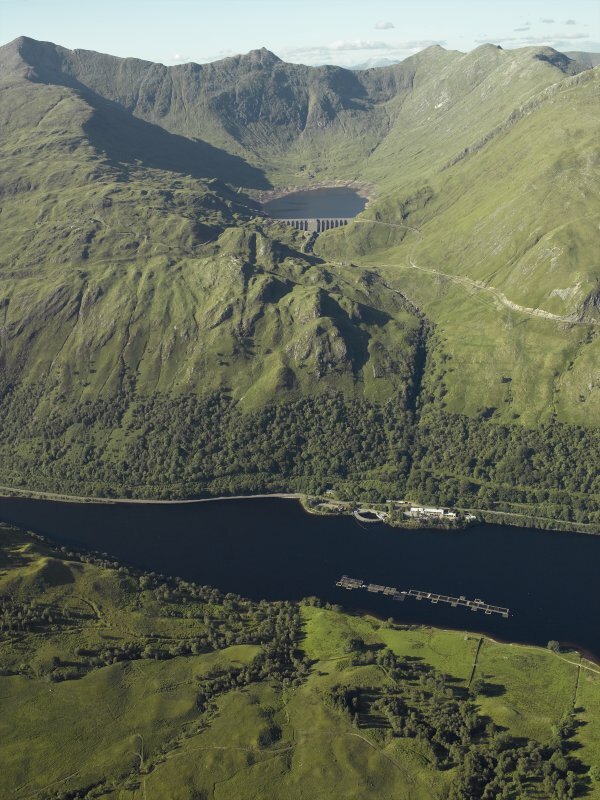 Pumped storage system: dam on Ben Cruachan and underground power station (Edmund Nuttall and Co). Installed capacity 400 mW. Photos taken in the 1960s by Andrew Simpson, scanned and contributed to RCAHMS. Twenty Six Photographs scanned from various sizes (35mm, 6x6, 6x9cm, and 31/4 x 41/4 in.) monochrome negatives. (A) Erecting Cupolas 001 to 015. Chill test pieces of Inoculated and Un-Inoculated Cast Iron from 001 to 015 and recarburised using the Porous Plug..
Chll Test Pieces marked “R”, taken directly from the receiver. 400mm Telephotograph from Great Western Rd. 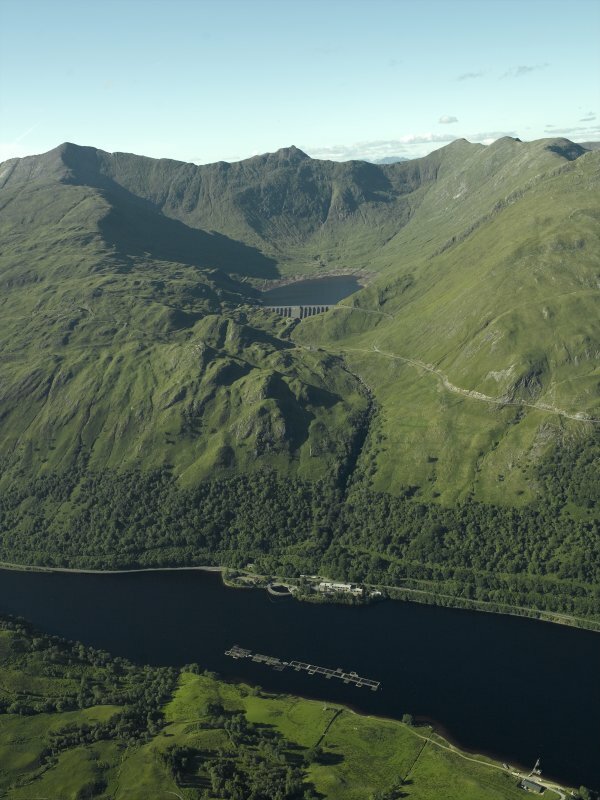 Cruachan Power Station is a pioneering example of pumped storage and the first to be built on this scale in the UK. Water is received via pressure pipeline from Cruachan Dam (directly above the turbine hall) which is used to generate power. At periods of cheap electricity the turbines are run in reverse to pump water back from Loch Awe to the reservoir. Ben Cruachan Turbine hall forms and A-group with Ben Cruachan Dam. 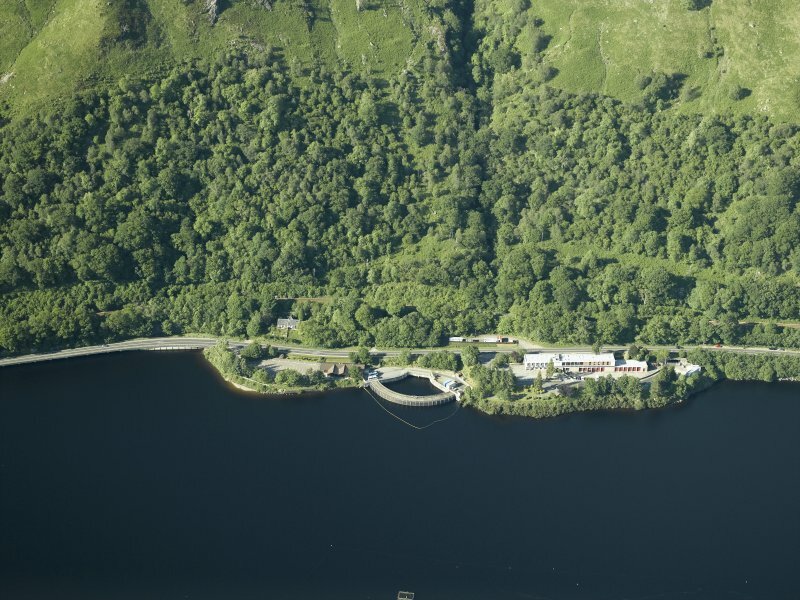 Ben Cruachan turbine hall is a monumental engineering achievement and an integral part of one Britain’s most innovative hydro electric power schemes and the first example of the use of reversible turbine pumped storage technology. The 3240 cubic metre turbine hall was hollowed out entirely from solid bedrock and is set deep within the side of the Ben Cruachan ridge. The turbine hall is accessed by a 1 kilometre long vehicular access tunnel. The lower end of the tunnel terminates in ‘the crossroads’ where secondary tunnels give access to visitors viewing gallery, transformer hall and surge shaft. The housing of a power station of this scale wholly underground in addition to secondary features such as transformers and pressure tunnels was pioneering and allowed for the development of a power station large enough to play a nationally significant role in energy supply in an area renowned for scenic beauty with very limited visual impact. 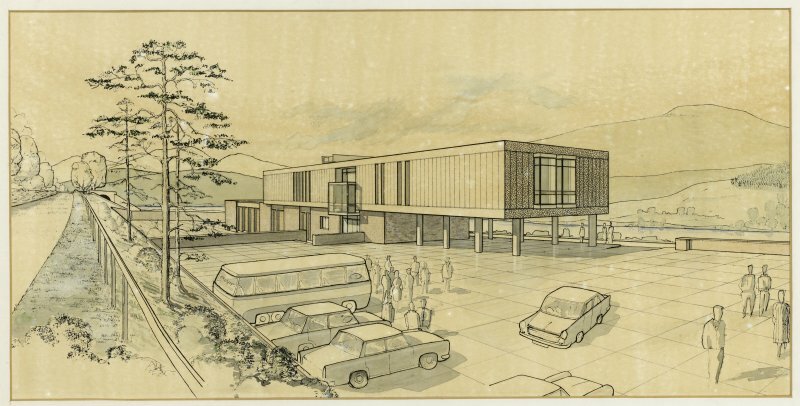 The station exhibits a number of period design features dating from the 1960s including the timber artwork panel by Elizabeth Faulkner and careful attention to detail in lighting and acoustic design, all with imaginative uses of timber and concrete. National Archives of Scotland (NAS), Ref: NSE North of Scotland Hydro Electric Board Collection (1943 -1990); NAS, Ref: NSE1 North of Scotland Hydro Electric Board Minutes (1943-1990); NAS, Ref NSE2 North of Scotland Hydro Electric Board Annual Reports (1943-1990); PL Payne; E Wood, 2002, 178-79; J Miller, 2002, 230-40; F A Walker,2000, 375. 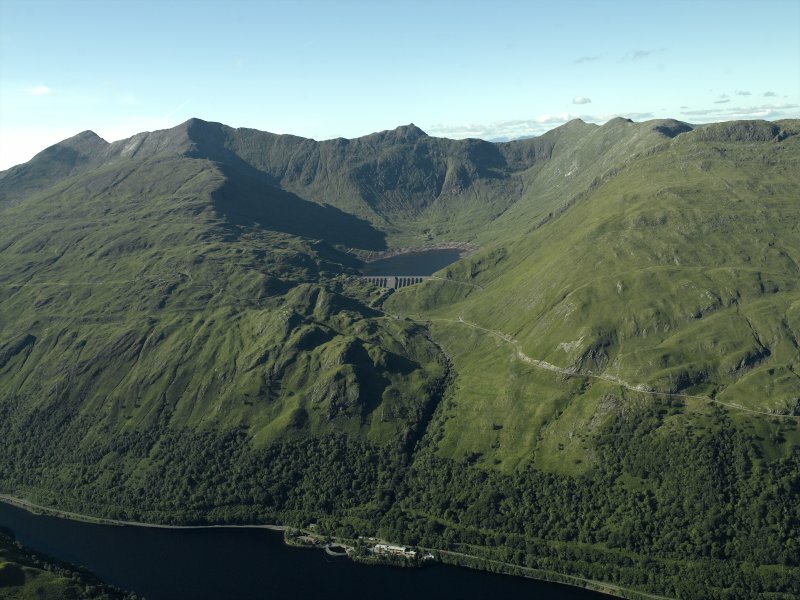 CFA Archaeology Ltd undertook an assessment of the cultural heritage implications of the proposed route of a replacement overhead line (YX Route) from Ben Cruachan Hydro Power Station to Dalmally substation. Although twelve cultural heritage features were identified, by the desk-based assessment, within the study area, few of the identified cultural heritage sites lie on the route of the line, or in the immediate vicinity of any of the towers. Taking into account the construction methodology to be employed, and the avoidance and mitigation measures which will be employed, it is considered that the overhead line replacement project will have no significant residual adverse effect on the known cultural heritage resource and will have little potential to disturb significant hitherto undiscovered archaeological deposits.